The Transformers are back, with better graphics, music and prizes. Everyone that grew up during the 90’s should be familiar with the Transformers. In fact, it was everyone’s dream to own at least one of those special Autobots. Then came the first Transformers movie in 2007 and a new generation fell in love with them, which was also when the developers Wagerworks created the first Transformer slot games. 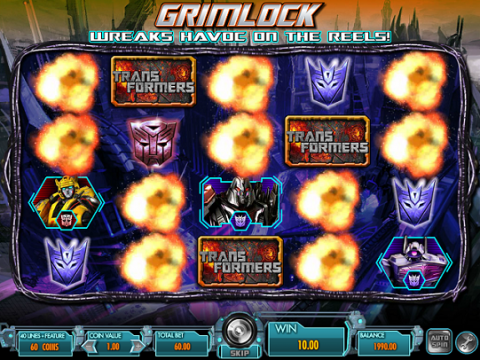 After collaborating with IGT the Transformers – Ultimate Payback slot was released in 2009. It was a breath of fresh air for the gambling community, however, the solo IGT project is a dramatic upgrade. After Wagerworks joined another company IGT took it upon themselves to bring us something better, namely Battle of Cybertron. If you’ve played the first Transformer slot game and you step onto this bad boy you will definitely notice the difference. The graphics in Battle for Cybertron slot game are much sleeker and there is a lot more detail, which makes the game more visually stimulating overall. There is also a big difference in terms of performance as everything runs a lot smoother. As for the soundtrack, well let’s just say you won’t be missing the old one. IGT decided to stick to their popular combination of 5 reels and 40 paylines, but they’ve added a very exciting FreeFall feature. When the FreeFall feature kicks in after getting a winning combination the winning symbols disappear. In turn, they are replaced with new symbols without the player having to spin. Needless to say, there is a chance to win some good money. To make things even more exiting there are 5 mystery bonus features to look out for and they are nothing short of amazing. But keep an eye on the Grimshaw and Shockwave bonuses. As Grimshaw creates chaos over the game some of the symbols get incinerated by the flames and this unlocks the FreeFall feature. The Shockwave bonus will also unlock the FreeFall feature, but it won’t follow the same pattern of course. When the Optimus Prime feature starts then all Decepticon symbols will be destroyed and when Megatron is unleashed the Autobot symbols are destroyed. Unfortunately you’ll have to wait for these features to strike randomly. If you were wondering about getting some free spins and multipliers then wonder no more. These are triggered when a Bonus symbol lands on reels 1, 3 and 5. You will get to choose one of 4 characters and each will have a different ratio in terms of free spins and multipliers. For example, going with the big man Optimus Prime you will receive only 5 free spins, but a whopping 8 to 10 multiplier. Bumblebee will get you the most free spins (15) although the multiplier will be between 2 and 4. This is definitely a game for the fans of that 90’s animation show, despite the fact that IGT chose to use the designs that featured in the blockbuster movies. There is flexibility and a variety of choice, a winning combination that can be seen in the Marvel slots, although this particular slot might not attract lower betting players.